On May 1, 1884, catcher Moses Fleetwood Walker signed up to play for the Toledo Blue Stockings of the American Association, a professional baseball league considered a “major league” in existence from 1882 to 1891 and was a rival to the National League. 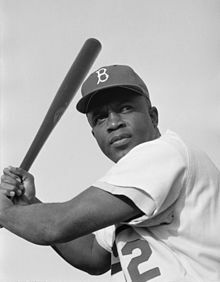 Walker, a black African-American became the first (openly) major league baseball player of African descent over 60 years before Jackie Robinson broke the “color line” in 1947. The reason why we note the word, “openly,” above, is because at least one other African-American played major league baseball before even Walker (William Edward White) whose name and light skin allowed him to pass himself off as a white man. 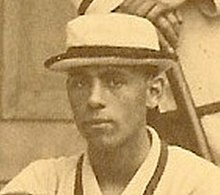 White photographed as a member of the 1879 Brown University baseball team. Just as Jackie Robinson would find out in 1947, Walker also faced bigotry and prejudice starting in 1883 when he began his professional baseball career, also with the Blue Stockings who were then members of the Northwestern League. The resistance to allowing Walker to play and sometimes refusal to compete if the Black man was in the game led to Toledo joining the American Association for the 1884 season. In 1884 later that season Walker’s brother, Weldy, also signed with Blue Stockings. Walker had been born in Mount Pleasant, Ohio in 1856 when the United States still maintained slavery of African-Americans. Walker enrolled at Ohio’s Oberlin College in 1878, and re-enrolled in 1881 when he starred on the baseball team. Walker’s play was good enough for him to be recruited by the University of Michigan to play in 1882, where he again starred, but encountered more racial friction from opponent teams. Moses then signed with Toledo to play professionally in 1883. Walker’s career in the major leagues was impressive, but short. Despite batting .263 in 1884, good for third in the league, he had so many injuries his season was cut short and he was released at the end of the season. Walker did play another 28 games in 1885 for the Western League, then become a businessman with his brother, Weldy, with a hotel/opera house venture. Moses played in minor professional leagues until retiring in 1889 from the International League, the last Black man until Jackie Robinson to play in that high a baseball league. Walker engaged in postal work, businesses, publishing, and activism for African-American interests, and was involved in a fight where he killed a white man in self-defense, being acquitted by an all-white jury. He died of pneumonia in 1924 in his adopted home town of Cleveland, Ohio, leaving a fascinating legacy of a man that should be far better known to History. No disrespect to the extremely courageous and influential Jackie Robinson, or the ground-breaking William White, but the fact is Moses F. Walker deserves credit as the first Black major league baseball player. If you are African-American, you may know his story, but if you are not, chances are good you are reading about it for the first time here. Show off your knowledge of sports trivia and baffle your friends with this tidbit of Sports History (and cultural history as well). Zang, David W. Fleet Walker’s Divided Heart: The Life of Baseball’s First Black Major Leaguer. University of Nebraska Press, 1995.